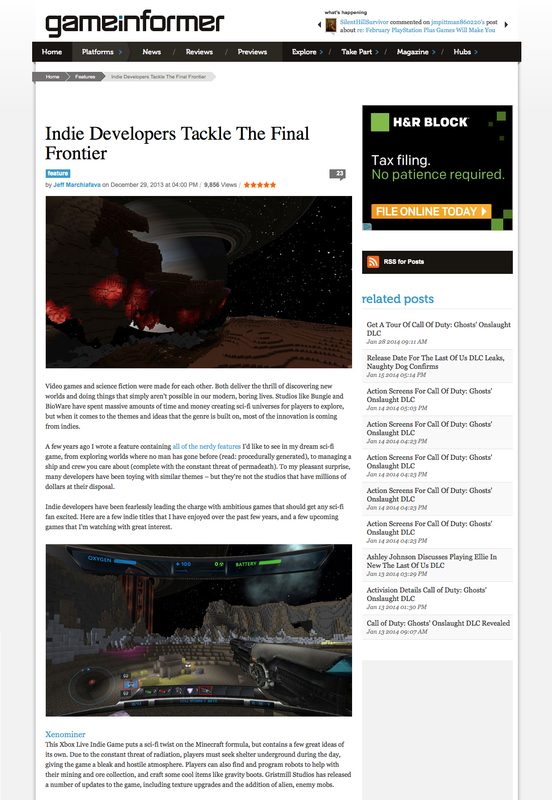 XenoMiner was featured recently on popular gaming website Game Informer as part of a write up on science fiction gaming called Indie Developers Tackle the Final Frontier. It’s awesome to be on the same list as great games like FTL and developers like Double Fine! We now have DownGate in review for Xbox 360, it should be coming out in a few days! 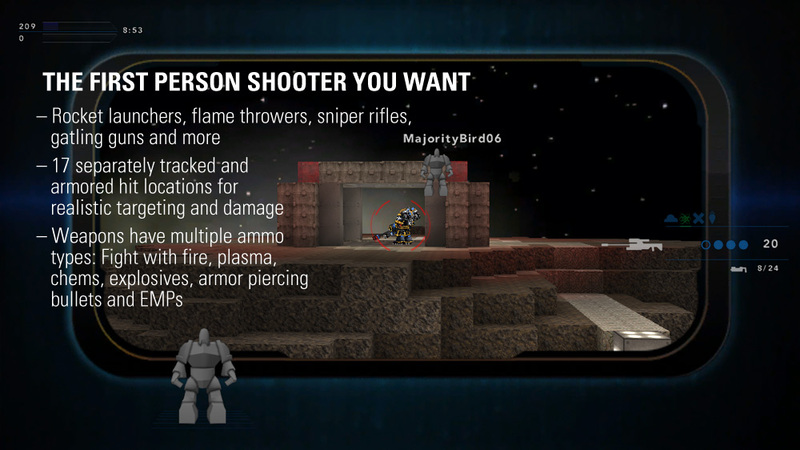 If you like XenoMiner, and you like shooters, you’re gonna like this game. We’ve also been co-developing some features for both games (set in the same world). So prepare your Xeno world for Grav Panels, which can push in any direction. We also have some other new voxels (more details on that later), much improved memory handling (smoother big worlds) and tons of bug fixes. This new Xeno update will be sent to review soon! Exciting News for XenoMiner fans! In order to support the studio, diversify our portfolio a bit and to help bring another developer or two on full time the Gristmill team has decided to target a second title release set in XenoMiner’s universe. Before you get antsy, it’s using the same engine as XenoMiner, and most of the work directly plugs back into XM, or can be easily transferred back … in fact, though it will be a second title, it will be less iterative and closer to a one-off: its intention is to help us reach a broader audience and to give us a chance to expand the studio. 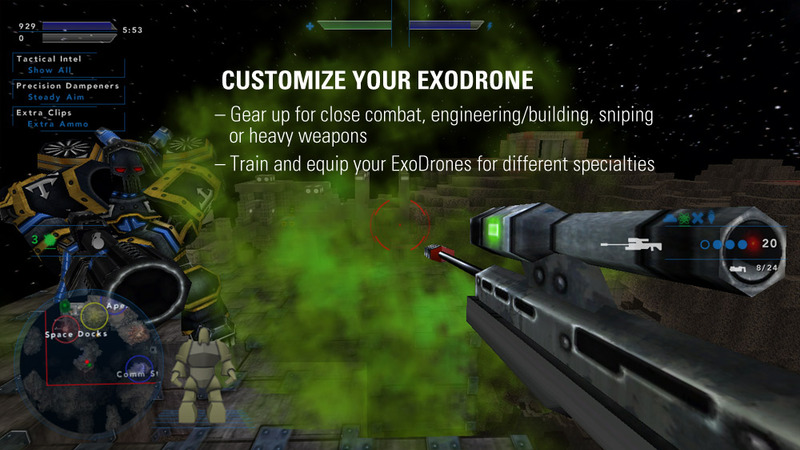 Very shortly we will begin Alpha testing a first person shooter titled DownGate – subtitled ExoDrone Wars. This game will expand the XenoMiner universe by detailing a completely different aspect of the story. The game will originally be set on and near Xenos an indeterminate time in the future … perhaps 30 years or so. As a teaser, we published Blood and Fortune as an intro story for the game. Word of Xenos and its incredible Endurium veins have echoed throughout civilzation and now political and corporate factions are moving in to seize control of the lucrative moon. As in the story you read, many of the battles are fought by elite units of Exodrones – these cybernetic super-soldiers are a graft of heavily augmented organic tissue and machine that are grown and manufactured as empty shells, possessing no life of their own. They are piloted by conscripted youth, age-locked in adolescence. Via technology called a DownGate, the pilot’s consciousness is transferred from their own body into the brain of the ExoDrone. From there they can pilot the drone “in the real” with full sensory interaction and no issues with connections or latency. They can also transfer to a new drone or back to their own body on death, allowing them to learn from each battle and only grow more experienced over time. DownGate will be a First Person Shooter and will take full advantage of many of the elements that XenoMiner uses, but this time set in a game environment better fit for war. 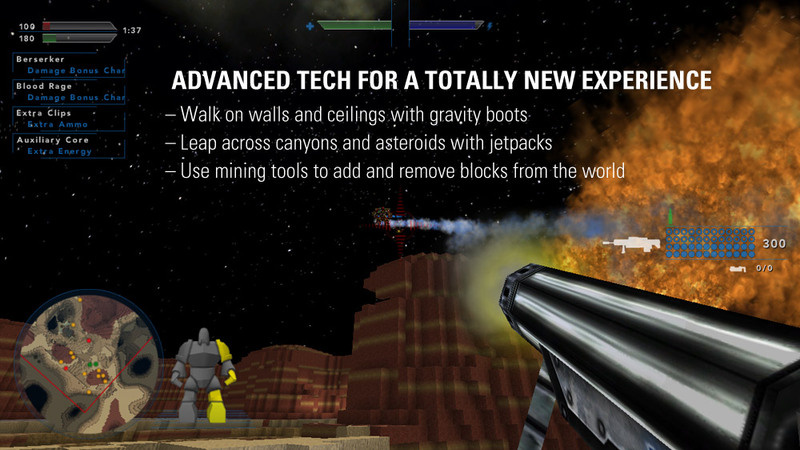 Many of the cool and unique features we have in XM will be translated into incredibly fun FPS features: Jetpacks, Grav Boots, the PICK – the destructible (and constructible!) terrain as well. Why aren’t you just adding X/Y or Z to XenoMiner? Yes, but why not just add this mode to XenoMiner as part of that game? XenoMiner is a story of survival, exploration and building. It’s about conquering a hostile environment: essentially it follows the story archetype of “Man vs Nature.” To add a “Man vs Man” story archetype to it would distract from its vision and water it down. Perhaps in a future version we may be able to marry the two ideas in some grander, bigger game, but for now it seems best that we leave XM as our survival game and let DownGate become our warfare game. But there’s still so much to do with XenoMiner, why aren’t you just focusing on it? Really this is the same as the first question. We want to expand our audience, which gives us better potential to succeed as a studio in the long run. It helps us build a community for Kickstarter or Greenlight success. We also need more operating capital than XenoMiner alone can produce, because we want to bring more developers on the team full time. Though XenoMiner itself could be HUGE, to get it there will take more than one man full time and the rest of the team working after work – so many of the issues we struggle with for weeks at a time could be easily handled if we had a dedicated team staffed. Does this mean you’re done with XenoMiner?! Nope, not hardly. XenoMiner is near and dear to our hearts and we plan to continue working on it for the foreseeable future. It’s an iterative release game, so even if we move it from “Beta” to “Release” we’ll still be adding new stuff. This isn’t even that, so have no fear! If I own XenoMiner, can I get DownGate for free? That would be awesome if we could afford it, but the primary reason we’re releasing a second title is to raise money to support the studio. We’re not greedy and we’re definitely not rolling in cash – we barely get by as it is, and it was a big risk and life change for our senior architect to make the leap working for Gristmill full time. We make a lot of sacrifices to create these games, and we’re hoping those sacrifices are worth a few of your hard-earned dollars. Will there be any Bonus Content for owning both? We’re glad you asked. Yes! We plan to include an unlock code in DownGate that will let Xbox users unlock some of the bonus content that comes with the PC packages. We will probably add a code to XenoMiner that does something similar for DownGate. What systems will this be for? DownGate will begin as an Xbox release. PC may follow after, and wouldn’t take much work, if we see a good response to it on Xbox. If it is successful on Xbox, we will also consider moving it to Next Gen consoles (just like XenoMiner) when that opportunity arises. For now supporting the Xbox 360 version of DownGate will be the best way to help push it to other platforms. How long do you expect this to take? Will XenoMiner development stop in the meantime? Not long and No. We expect to have a testable version out to our Alpha Testers within two or three weeks, and hope for release by December. This is not a promise and these estimates could change wildly. $1 on Xbox 360. IF we move it to PC/Xbox One/PS4 we might consider a Free to Play approach, so that more people can access the game (we know a lot of our fans just don’t have the cash, or are younger and can’t always freely buy a game at cost) and so that those superfans that really like to support Gristmill can “buy in” to the experience as much as they like. We’re still feeling that out, so consider that a thought and not a promise or prediction – obviously we’re open to discussion on the matter. So, what’s it going to be like? In a word: AWESOME. 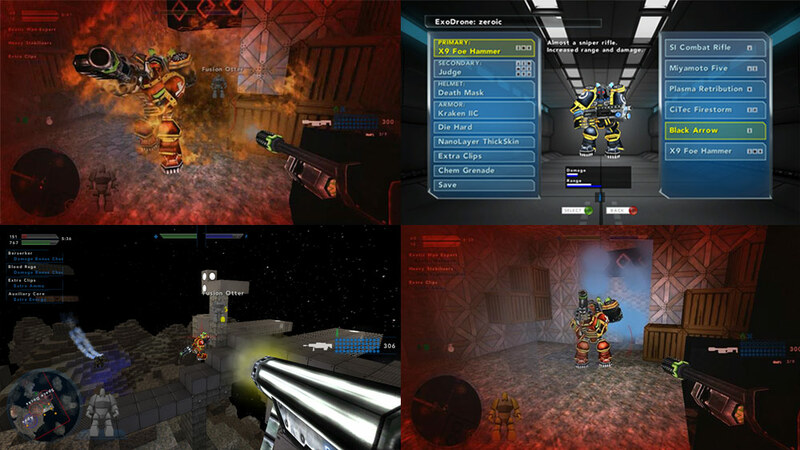 If you’re old enough to remember the Golden Age of FPS, you probably remember Unreal Tournament and Quake Arena … how could you not? We want to capture that over-the-top arcade feeling of an FPS where you are the hero, a demi-god of war and it is pulse-pounding intense every second. Can we get it there? We hope so, we’re going to try. Your questions and discussion are welcome and appreciated. We couldn’t do this without you, and we’re honored to have been doing it this long: we hope you’ll come with us on this next big adventure. The Multiplayer and Mega Terrain Update for XenoMiner continues through Alpha Testing. Testers have set up servers hosting several players now without signs of lag or errors, and MP is looking really solid. “*shock* I need whoever did the work on the caves to get a pat on the back… I mean WOW!